Urban exploring, the hobby of visiting abandoned industrial buildings, military camps, airports and other buildings, is surreal already. You enter deserted worlds and lost civilisations, and feel as if you are really alone. Silence instead of the regular loud, fast-paced life of our society. It gets even more out-of-this-world with the street art of Plotbot Ken. The Berliner has specialized in layered paintings, combining several techniques and using them to construct art pieces that blend with their environment. 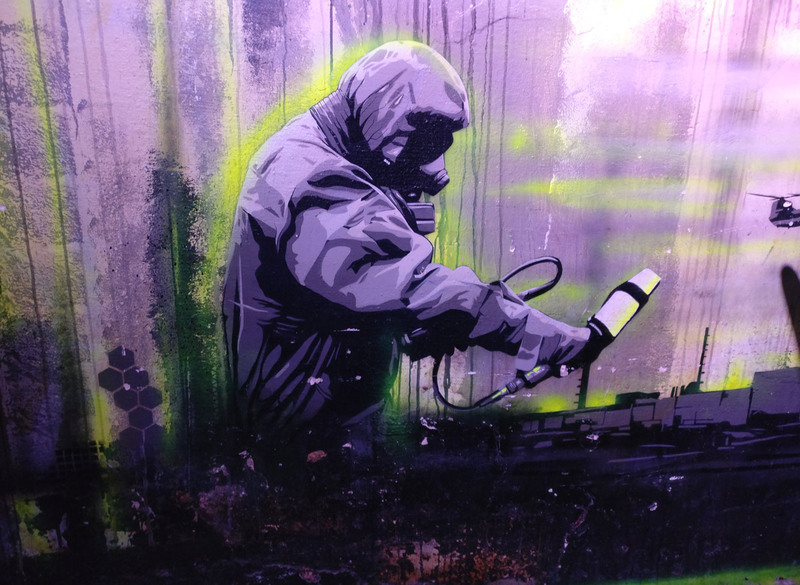 As he usually chooses abandoned buildings and factories, his themes tend towards science, industry and contamination. Especially his works at the former chemical plant in Rüdersdorf left a deep impression on us. Below is a video of how he made four of the six pieces there, and there is another site with an overview of work on other locations. Acid Tanks from Isa ZA-P on Vimeo.